Harvested in the Brazilian Amazon, they’re known to be a superfood powerhouse. Also known as dragonfruit, stems from several cactus species grown in Central and South America. Chia seeds are best eaten soaked, so they are easily digested into the body and greater nutritional value is obtained this way. 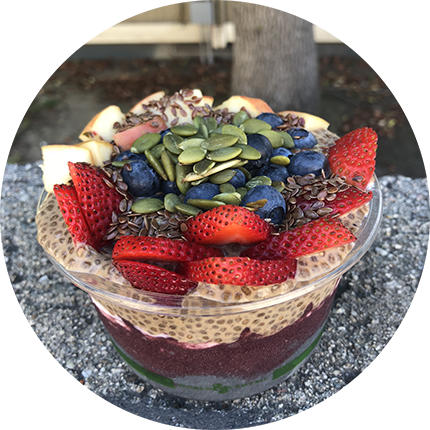 Our chia pudding (made from plant-based milk) consists of chia seeds that are soaked overnight in a milk to create a pudding-like consistency. Matcha is a grounded powder of dried green tea leaves, known to boost metabolism and has cancer-fighting properties. Our Matcha, just like acai, is then formed into a sorbet and served cold. Activated Charcoal is known to be a great detoxifier when ingested, as it binds to the toxins in your body and cleans out your system. Our activated charcoal coconut base is made with organic coconut milk, coconut cream, and coconut nectar and is served as a sorbet. Granola: Honey Oat, Chocolate Chunk, French Vanilla, Hemp Seed. Fruits: Pineapple, Mango, Apple, Blueberries, Strawberries, Bananas. House Made Nut Butters: Peanut Butter, Almond Butter, Cashew Butter. We make our own nut butters here, so there is no added preservatives. We use fresh roasted nuts. 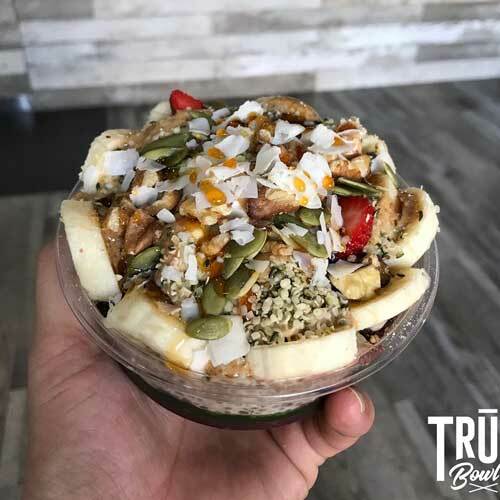 Seeds:Hemp (rich source of protein, iron, and omegas 3 & 6), Sunflower (good source of Vitamin E, Calcium, Iron, Potassium and Protein), Pumpkin (high in fiber and anti-oxidants). Extras: Cacao Nibs (provide great source of anti oxidants and are packed with fiber), Goji Berries (high in anti-oxidants, boost immune system and brain activity), Coconut (high in iron, calcium, magnesium). MCT Oil: A natural source for immediate sustainable energy, brain focus & memory, great for skin health. CBD Oil: Relieves arthritis pain, combats anxieties, helps fight cancer, reduces risk of type 2 diabetes, and aids in sleep disorders and has anti seizure properties. Drop in and satisfy your thirst for health, energy & anti-aging!